COACH 2419 D.......on track of little known history! "History is written by the victors".Origin of this famous quote which surfaced soon after world war II is unknown.Could be true but it could have come from a loser as well, I presume. When one goes through hundreds of historical events, known to everyone about the WW2,one incident remains not that known but has played a major role not only in WW2 but well connected to WW1 as well.It took place at Compagnie, a large town situated north east of Paris.One can reach the place,on the edge of a forest in 1h 30m by car. Though not frequented by a lot of tourists, Compagnie has many historical places and churches of reputation. But what I am to write is about a railway wagon preserved over there to be exact...about a dining room which turned to a war room. Germany was defeated by France in the First world war.A ceasefire agreement- armistice- was signed between France and Germany, on request of later, in November 1918 which ended the war within few hours thereafter.I think France chose the time and date of 11.00 hrs on 11 th day of 11th month of that year is not by an accident- a date to be remembered.Marshal Ferdinand Foch of France used his office, a converted railway dining car wagon at Compagnie as the venue for the dictated negotiations to be followed with the signing 'ceremony'. 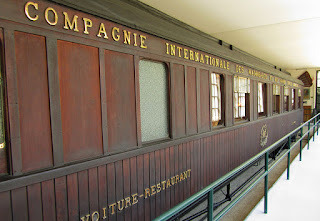 Thereafter the railway wagon was displayed in Paris and few other places in France for the people to see before it was placed inside a protective building at Compagnie. Subsequently The Armistice Memorial - a fallen eagle(Germany) killed by a sword(French) on one end and a statue of Marshal Foch himself at the other end were erected with a concrete platform where the railway wagon stood in between.It remained as a monument to the defeat of Kaiser's Germany!! France was attacked by Nazi Germany during Second world war.Finally France sends a request for an Armistice to Germany.Hitler might have rejoiced over this request as he ordered the same railway wagon at the same location as the venue.When he was advised that the wagon was kept inside a protective building, he ordered the same to be brought out breaking the building!He wanted to give back to France what was done to Germany in the first world war. Hitler himself visited the wagon with his deputies.He sat on the same chair Marshal Foch sat while one of his assistants read out the terms of the armistice to the reps of the French forces.France did not have any room for negotiations and they agreed readily.At that point Hitler left the scene deliberately.He wanted to humiliate France further leaving the formalities and signatures to his subordinates! Once again an agreement was signed on 22 June 1940 between Germany and France but the seats were swapped!! Railway wagon was brought out of the building! 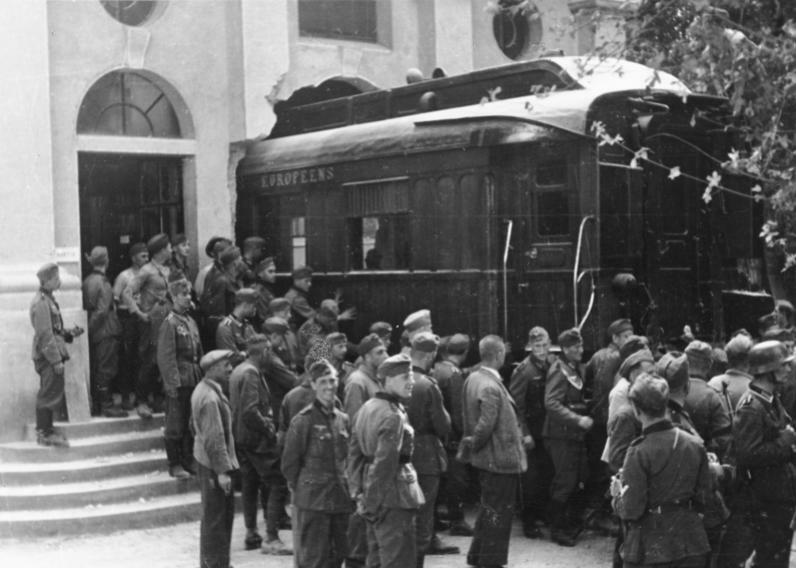 Hitler ordered the same wagon to be transported to Berlin and exhibited before the people. Later he ordered to break the Armistice memorial -en eagle killed by a sword- to be bulldozed! Obviously Hitler wanted to avenge the defeat meted out by France in the First world war in the same degree!! But towards end of Second world war in 1944, the wagon was ordered to be moved to central Germany and kept under protective forces.When he came to know of advancing US army to Germany,Hitler ordered his infamous SS men to destroy the wagon which was done promptly!He might have feared a back lash in the same coin again from the allied forces! 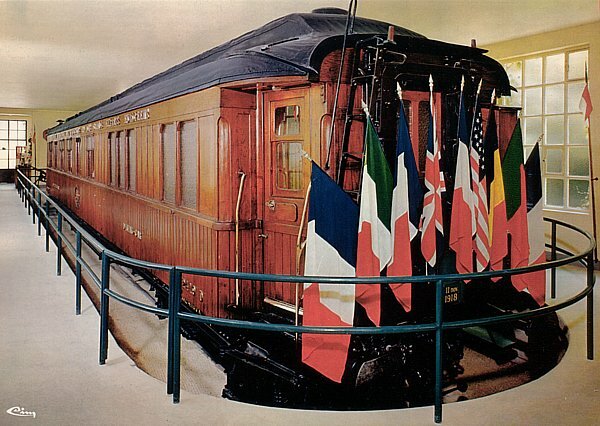 Victorious French Govt wanted to keep the wagon in the same place and venue after WW2. Since the wagon was destroyed beyond trace, they made an exact replica of the railway wagon and kept it in the same museum, as it is seen now! Hopefully it may rest there for good now.But only we can wish so!